How to run a marathon with no training. 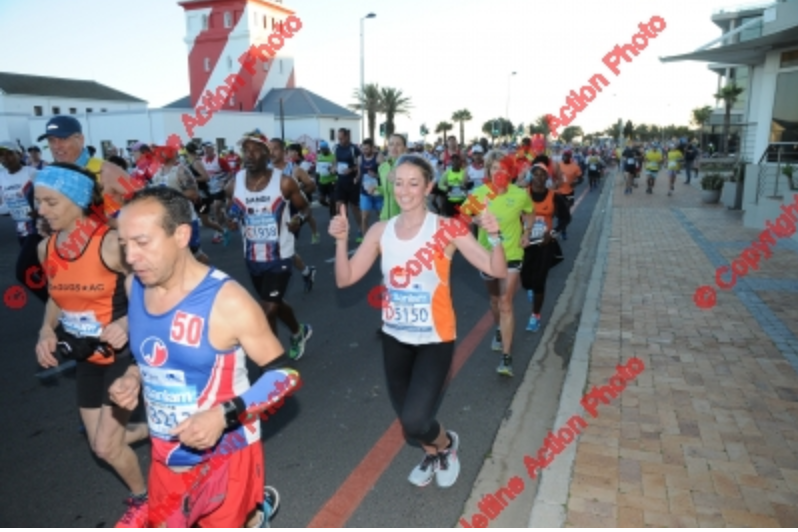 On 17 September 2017 at 7am, I toed the line for my first ever marathon. My training plan leading up to the race completely fell through. In the month leading up to the race I ran a total of 6km. Ha. 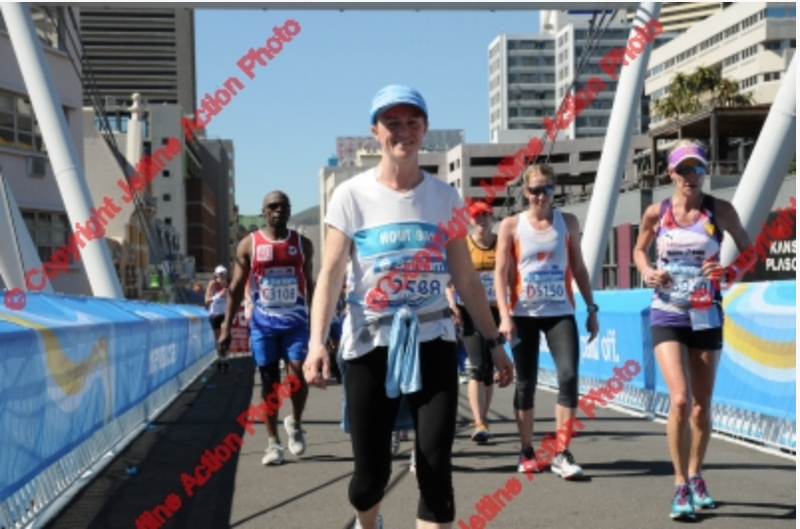 But as I stood there that morning singing Nkosi, I was 110% certain that I'll cross the finish line in less than 4 hours. I’ve run the distance before, but never as a race. And you know, races are different. That silly lil time chip does something to you mentally. Like a bull seeing red - it makes you want to just "go!". So ya, I really wasn't setting myself up for success. You see, the distances aren’t too far, and with enough grit and a high pain tolerance, it’s actually a very efficient way of going about things. No time spent on training, and you still get to race, get a medal and tick a box. Bam. During the 94.7 Cycle Race I did get off the bike at some point, and found myself on a sidewalk, crying. 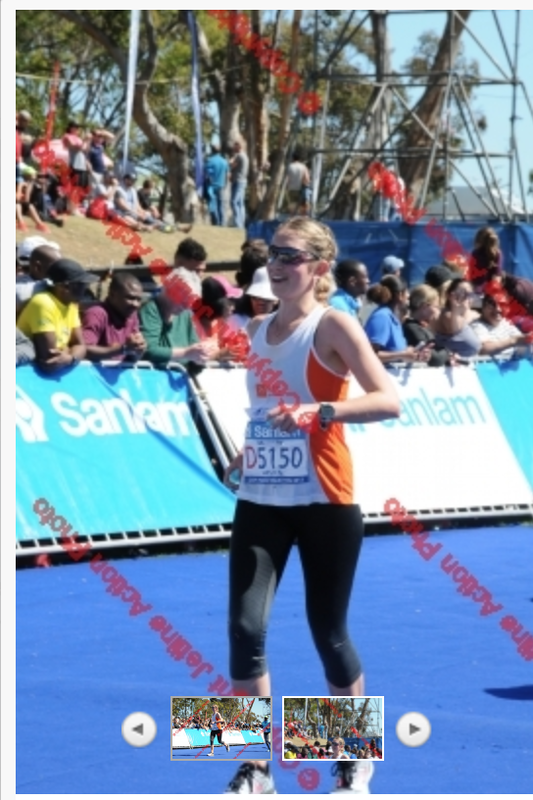 I then promised myself to NEVER kamakazi a race again. But, it somehow became my fall back plan for the marathon. To be very honest, my thinking was that there are so many people running marathons, how tough can it really be? (I know, you can roll your eyes at me). Let's just say that I’ll never, ever say that ever again. 2. The theory about “the race starts at 30km” is true. 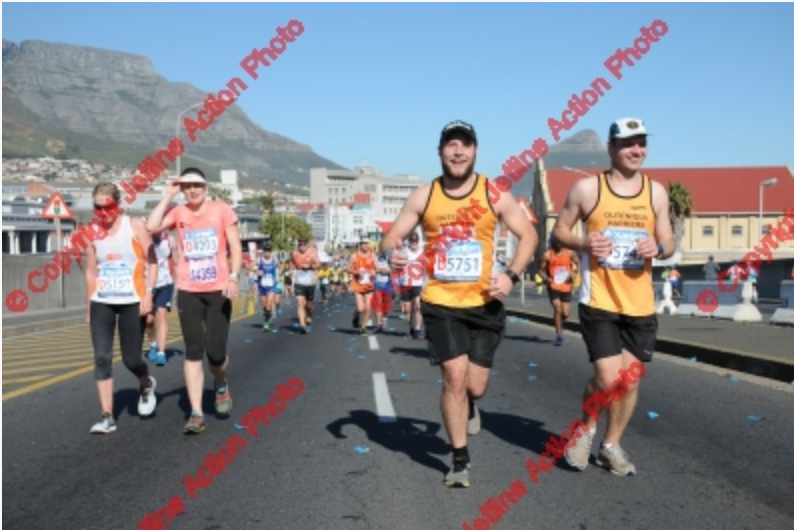 Everything was going swimmingly until the 21km mark. The miles flew by and I felt strong, running an easy pace, enjoying the experience and chatting away to Sabrina, my running buddy. I was still int he “marathons are easy” mode. Literally, just as I passed 21,5km my legs started feeling tired and heavy. In complete denial of this, I put a brave face on and trotted on. But, somewhere between 27km and 29km the wheel-bearings became loose. I got slower and slower. By now my legs were weighing 100ton each. What the heck! By 30km as we hit the N1 enroute to Paarden Eiland, the wheels completely came off. No more brave face. 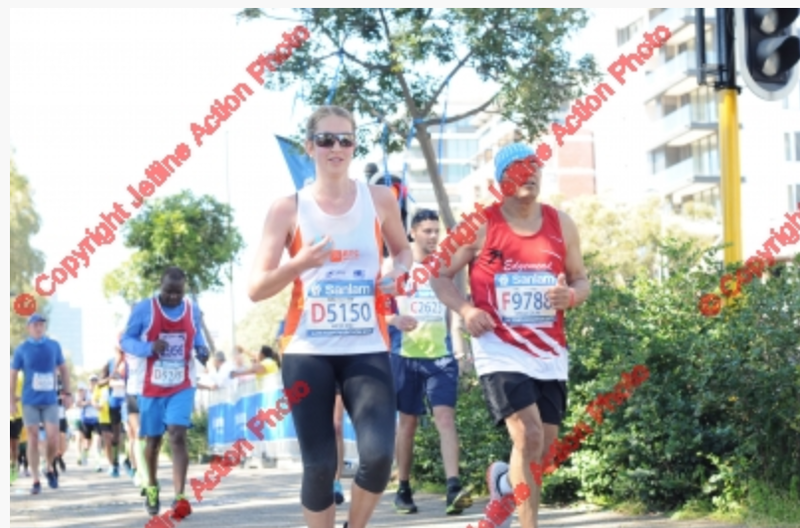 Also, why the heck did they make us run along the N1 to Paarden Eiland in the heat of the day? Last time I checked Cape Town had no shortage of beautiful roads. From 36 - 40km all I could think of was “Just make the pain stop. Make it stop. Make it stop. MAKE IT STOOOP!” I was not stoked to be there. The final 200m I managed to start trotting again. More like shuffling - just enough to pretend that I’m okay... and for Joe to snap a photo of me on the blue mat. Fitness was not on my side, so I had to be smart if I wanted to finish sub-4. I worked out that I had to run nothing faster than 5:40min/km and nothing slower than 6:30min/km to secure my sub-4 spot. I then made contingency plans for what is the slowest pace was I could run to finish in less than 4:30, 5h, 5h30, and 6hours. On the morning of the race, I took a permanent marker and wrote all these times on my inner-left forearm. Half-asleep, I then proceeded to rub sunscreen over it rendering about 25% of it completely illegible. *Insert applause for the blonde move. The psychology of having a plan is great. It gives a sense of security, even if the plan fails. I switched to a gluten-free, dairy-free diet on the 11th of August 2017. I know this date, because the night before I had my very last pizza. RIP Gluten. For food, you want to eat something that’s high in energy and protein, but low in crappy sugars. You don’t want to have spikes. And you want to start eating before you feel hungry or energy depleted. So, my eating plan was to front load. Thus at 13km, 24km and 32km. The last part of the race you’re so over it, that you can’t imagine eating anything. SO chow your food before you hit this point. So for food, I bought the Woolies gluten free, dairy free date balls. The ones which they sell in packets of 3. I rolled’ed up in plastic and stuck them into my leggings by my belly. They worked amazing, albeit a bit dry. I coordinated the eating with water stations… so that I had water to swallow them down with. Pro tip: Only eat on the downhills or flats. DONT eat when running up a hill. I’ve also severely reduced my sugar intake - so no coke on the run. Just water. I worked super well. Because of the heat, how much I sweat, and since I knew I'll be out on the road for a while, I planned to take water at every station. I took about 3 sachets. Drank one, used one for cooling down, and carried another with me just incase I needed it. There was one Powerade station where I had 2 cups of the blue goodness to get some electrolytes. It made a huge difference. Sheesh! I’m a salty sweater (overshare) so electrolyte and salt intake is very NB for me. Ah yes, for breakfast I went for high fat, low carb. An avocado, a rice cracker, and a few sips of rooibos tea, and a glass of water. I ended up crossing the finish line in 4hours in 19minutes. Not bad :) Next time, I'll run a bit more before the race. And HUGE respect to every person on this planet who has completed a marathon. Also, please don't run a marathon without training. It's awful. I switched to New Balance a short while ago, and had zero issues with blisters. Yay! Some girls chafe “down there”. If you’re one of those, use vaseline...generously. Some people also use it between their toes. I don’t chafe down there or between my toes, luckily. *touch wood. But flip, did I chafe under my right arm? I still have marks! It's so weird…it was skin on skin. I still don't have an explanation for this. No earphones or music allowed - so have a running buddy. Sabrina and I ran together the whole way. 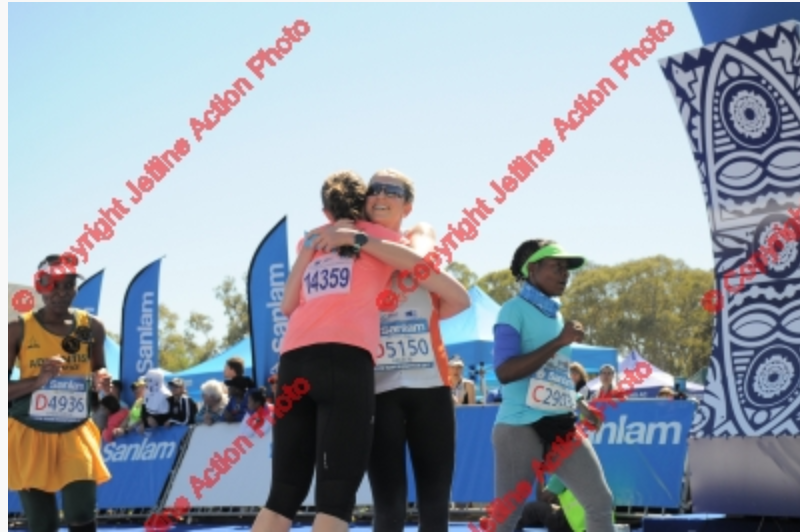 But she really pulled me through from 30km till the very end. She is hands down one of the best humans around. Wear sunscreen and wear sunglasses or a hat or both. My eyes are so sensitive. So, sunnies it is. 30km. Wheels starting to come off. 42km. Digging deep for a final trot. 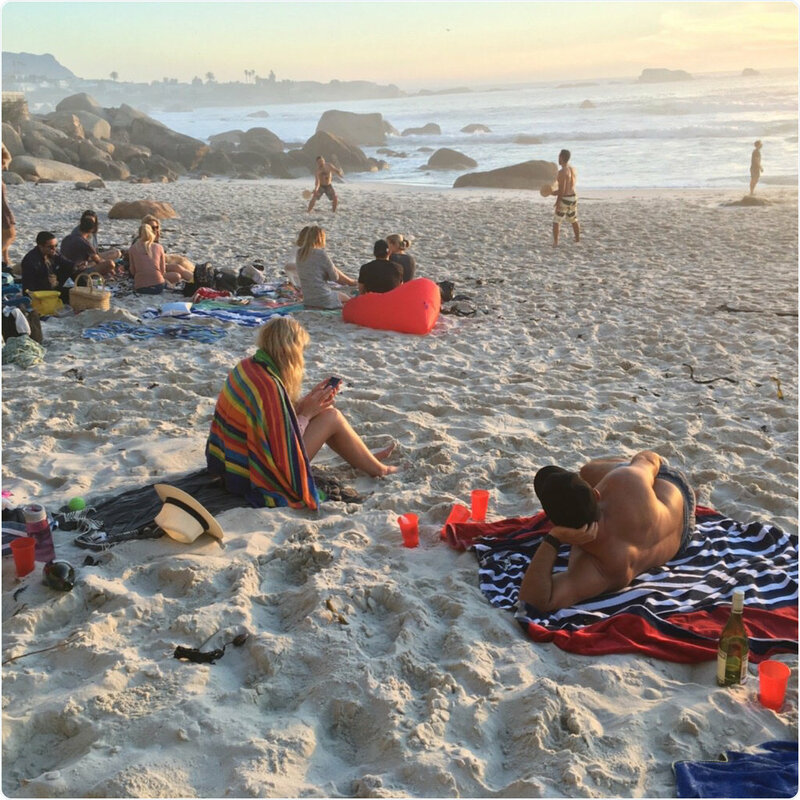 Post race relaxation on Clifton 1st.